I'd had a notion to do this with multiple designers over time and then Jason's list last week made me consider just choosing one game. In the end I reverted back to my original idea. Francis Tresham is one of the most influential designers, particularly with regard to his stature in game design relative to the number of games he's primary author. 1) Early impressions (if you've played the game). 3) Elements of the design that strike you. 4) Flaws, or elements that would be refined in light of later game designs (more modern). Evil genius or the beneficiary of a happy accident of elite design....twice? What other designer has such a significant game as their first design credit? 1829 (and there are follow-on games) created the foundation for the later 1830 (more on that later). I have to admit, I wasn't really gaming at the age of 2 when this came out. Its not clear to me whether it made much splash at all at the time of its release. Played today, its not really cut-throat in the sense a lot of the later 18xx titles are....but it does model the track development and stock investment that is the basis for that entire genre. Also known as "Kingdoms", this came right on the heels of 1829. It sounds like a multilplayer abstract for the most part. Not widely owned and even more rarely commented upon. Anyone have any experience with this title? Of course this one had lots of small expansions, and ultimately augmented by Advanced Civ (note that Jennifer has a designer credit on that one!) in 1991. I'd love to hear more about that process from her. I view this as another game that pioneered a new game genre (including overlapping into video games). A stock market game from Francis Tresham that has almost no presence on BGG. Evidently this one wasn't very well received, but I can't find out much about it. Anyone with any exposure? I don't know a lot about this game which appears to be about colonizing the New World and piracy. But there are a couple of folks on our list who have played or owned this game. This is one I'd really like to try. There are two families in 18xx: those games descended from 1829 and those descended from 1830. The 1830 family is much more cut-throat and involve stock market shenanigans. You can win the game without ever really running a profitable or 'successful' company. 1829 seems to maybe have wider appeal in some ways (or it should) since it doesn't support some of the nastier elements that turn people away from 1830. Of all the 18xx games to follow (and there certainly have been some innovations) 1830 is arguably still the best in terms of replayability and diversity of strategic success. I've often wondered how much of that was a deliberate design choice by Francis and how much was just a happy accident. For example: if you ever look at the heat map of the stock market you realize that the places where you can get the most (or lose the most) from stock investments are a good place to hop on and off stocks. But did Francis place those values where he did because he is an evil genius, or did it just happen to work well? from 1995 to the current day (as far as I can tell) Francis released a series of games and small expansions to add to the railroading England series. I regard these as being part of the 1829 lineage of 18xx titles. That is: they emphasize building a network and running a company well, with very little in the way of stock market shenanigans. I'm a bit frustrated that I've never played this one yet. I've owned a copy for a few years. Its well regarded. Anyone who has played it have comment? 2) random factors - players receive hands of cards and are able to purchase shares from what they are dealt. I've never actually played this one multiplayer, but that concept is anathema for a lot of 18xx players who relish the open information deterministic play of other titles. The biggest highlight is simple - I played 41 games, which is at least double what I expected and five times what it could have been. But let's start with Goa. I played Goa last night - and hated it. Not for the company (which was fine), but because of the razzlefrazzle decision to change the game for the Z-Man edition. While I thought I remembered the differences, one of them blindsided me mid-game - which _really_ annoyed me. So I spent the remainder of the game with a goal of having more money than the bank; I succeeded. But - in terms of long-term effects, it lowered my rating to an 8. The fact that - when I wish to play Goa - I have to make sure it's the right edition really bugs me. I wish Dorn - having decided that he wanted to change the game - had simply done real additional development and created a Goa 2 (or something even less directly connected). Thankfully, most of my plays were far less annoying. I played Banditos, Die Fugger, Thinking Man's Golf, Morels, Sweep!, Hammer of the Scots, Old Town, Black Vienna, Carcassonne, The Election Game (from The Next President), Black Box, Perry Rhodan: The Cosmic League, Gateball?, Scoozie, and Honeybears for the first time in 2013. I'm not aiming to play all of the games I own in 2013, but I've still made it to 222 out of 287; my natural preference for variety is pushing me to pull out titles I haven't recently played. Of the group, the two I think are on the border of leaving my collection are Die Fugger (which is fun enough, but doesn't stand out - a frequent issue with Adlung games) and Morels (which suffers from only handling two players). Perry Rhodan took a step forward for me - finally, I've expected it to for some time - and is safely in my collection. I played two games for the first time. I borrowed a copy of RRR, and quite enjoyed it, though I'm not tempted to hunt one down. And I picked up Renaissance Man, which works (once we sorted though an unclear portion of the rules) but in two tries didn't thrill. I also played Blockade a second time, and moved it to my trade pile. Probably the highlight of the period was a play of Merchant of Venus, where I found Jump Start in a telegate-heavy game; I then couldn't roll my needed pilot die (even on four dice) to save myself. Asgard's Chosen - I've been waiting for years for this to come into print. I hope to get it to the table this week. 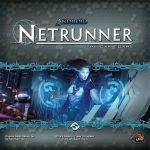 Android: Netrunner x15 - I've been playing this a ton recently, much of which has been in preparation for the tournament held last Friday in Glen Burnie, MD, as part of Fantasy Flight's Plugged-In Tour. I've also managed to get a third player and we are now doing Sundays. While I'd love a few more, I'd be happy with even one more and I think I could call that a league. Which finally allows me to stop using the foam core I had been and have something wonderfully portable. Guido: I'm fond of using 2 Bounty Hunters in Firesprays with Heavy Laser Cannons supported by Howl Runner and Swarm Tactics. If you haven't had the chance to try that out, you REALLY should. Relic Runners x2 - I think this might be the best DoW game since TtR. It's a medium weight logistical game with special powers, and a sort-of tech tree. It also has some of the nicest bits of any game and in a way is a throw back to board games from the 80'ss in that respect. I've now tried it with 3 and with 5, and I probably lean toward 4 being the sweet spot as you want the competition of a full board but without the inconvenient timing that occasionally pops up in the 5 player game. this is going to see a good number of plays before it gets a break. 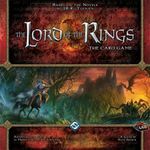 The Lord of the Rings: The Card Game – The Black Riders x2 - OOF the first adventure was tough. We tried and failed twice. It's a totally different ball game and it starts off difficult. Uchronia x1 - I wasn't sure how I was going to like this one as I'm a fan of the original version, Glory to Rome. I'm happy to say that it feels more accessible and streamlined. My wife never really cared for GtR but she really enjoyed this iteration. I'm missing the cards all being one element rather than the buildings/powers being a separate part. I do not miss, however, the competition over the foundation cards; there always seemed to be something a bit sloppy about it. Scream Machine x1 - I'll admit it, we called this one early when one player had a huge lead. It's a shame because I always had fond memories of it. Ironically, a more recent game we enjoy, Boss Monster: The Dungeon Building Card Game, uses the same symbol majority system. It's funny how you discover the ancestors of newer games like that. El Caballero x1 - My wife had never played this, and while I've played it twice it had been a while. I always enjoy abstracts and there are so few multiplayer ones. While I was in Games and Stuff for the NR tourney I saw the new edition in it's TEENIE box. Chaos in the Old World x1 - I've been meaning to get back to this for some time, as it's a game most of our group enjoys and has a great deal of experience with. Two of us were one tick away from the dial win, but in the end I won it on VP's. Wow it's been a long time since I did a post like this. You'll see why below. I really hadn't planned to get anything, but there was a nice geeklist auction (the one that Shane linked to, I think?) and decided to bid on a few things, settling on two low-ticket items. The first is Hanabi, which I've been wanting since I first played it, but has been tough to find in brick-and-mortar stores. Hoping to bring it to the table this weekend. The other is Gem Dealer which I'm sure isn't that great. But I like Knizia's auction games, it has nice bits, and fits in our Gryphon bookshelf collection. We'll see how long it stays off the trade pile. Of course y'all know the main reason for this - I still get to use "surgery" as an excuse for a few more weeks before it sounds tragic. Not too much to report on these - but one highlight is Through the Desert was just as great as when Joe taught it to us - even a bit more intense with 4 players. Scott still really likes it, which is a huge plus. Sleuth was looking for a bit like it wasn't going over well, but it was really clear afterwards that this is a keeper. There was so much conversation between the 4 of us as to how to take notes, how the winner had deduced the solution, and ideas to play differently next time - I loved all that post-game talk! For such a simple concept, this one is a solid deduction game. 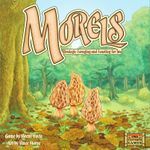 Scott and I took another crack at Morels and definitely still like, but don't love it. We used a circular forest path which made the gameplay simpler and faster. It just felt a bit too luck-driven with the card draws, but we'll give it another go or two. My hope is this will be a weekend with several plays. We have a postponed game day scheduled for Friday evening (Sherlock Holmes Consulting Detective: The Thames Murders & Other Cases is likely going to be the star), and then a gaming friend is down for a visit on Saturday/Sunday so I expect she'll want to play at least a couple titles. I had a real good week. We were camping so that played a huge factor I guess. We stayed in a cabin so when it was chilly and rainy hunkering inside to play cards seemed like the right option. It was also the first time I didn't go crazy with what I brought with. After filling the bag I took stuff out, then took stuff out again! I still had around 12 or so games probably but mostly small things. 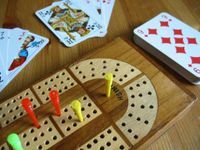 Of the games above 3 are Decktet games. Oh Quay is an alright game. It's very simple but is nice in that no table space is required to play. It would be a good one to play with kids if they could manage to hold the cards. Emu Ranchers is solid and I still like playing it. There is a KS for an IOS/Android app that will be free when launched. I don't think it will make it though as the reward structure is pretty strange. They are asking 1,000 to name one of the birds (a single card). EmDo did that with a level around 150 I think. At 25 you get a copy of a physical deck with Emu Art which is neat but expensive. The main thing is you really aren't buying a product which is what I think gamers are looking for from KS these days. The last was Colour Bazaar which is pleasant with 2 but great with 3. One thing I appreciate about the game is that I've never played anything like it. I guess I could draw a comparison between it and Airlines: Europe but they are so far apart that it isn't really worthwhile. Anyway it is lots of fun. I'm considering running a Decktet Day in decemeber when I'm in between grad school semesters. It would be a local event up here in the Twin Cities. If any of you are going to be around late Dec early Jan let me know! Galaxy Trucker -- always a favorite. It is best when everything goes wrong. Roma -- as I play this more, I like it more as I am getting to know the cards better. It is a nice, light card game. The Lord of the Rings: The Card Game x 7 -- finally started playing this, and building my own decks. Suffice it to say, I love it. I have always been a fan of CCGs, but never get to play them. I love that its coop. I love that it is hard. What I may or may not like it have to "tweak" my deck for specific adventures. I haven't had to do that yet, but we will see. I am currently playing at work with a co-worker, and we are working through the adventures in order. We are starting Escape from Dol Guldar today. Spyrium -- a nice, light, worker-placment game. It doesn't do anything new or great, but I enjoyed it. Robinson Crusoe: Adventures on the Cursed Island -- a coop, one of my favorite designers, so it was bound to be fun, right? Well, it was. I loved it. It has a great narrative, and fun. The rules seem cumbersome, but since I was taught it, it helped. I managed to snag a copy via the BGG.Con Virtual Flea Market. I don't have the patience for Z-Man anymore. Sushi Go! -- very light, fun. I think I will need to add this to my ever-growing sushi game collection. I am up to 4 now I think? 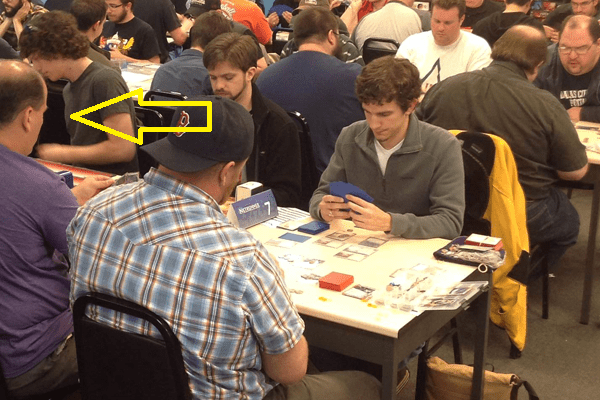 Android: Netrunner x 2 -- still like this, but I never get to play to get any better at it. I am going to try OCTGN sometime, but I haven't braved it. I want to play face-to-face, but these types of games just aren't played that much here. Pathfinder Adventure Card Game: Rise of the Runelords – Base Set x 3 -- we finished out the initial Adventure Path. So far, I still enjoy it. Though for this to stay interesting the next Adventure Path really needs to bump the difficulty and game variation. I like it for what it is, but it is getting easy and very repetitive. I will continue buying it, but if it doesn't get harder and more varied, I don't see it lasting in our group. I believe I got signed up for a ladder league after I thought I'd opted out. Anyway, it was fun...but I'm not very good with the newer cards. I find myself enjoying Carcassonne variants more and more over time. I know this isn't a new game, but its new to me this year. I traded for a copy, and really enjoying this one. This is a 2p only game, so not one I am likely to get on the table often. But I was pleasantly surprised at how much I enjoyed it. This game is all about manipulating the train rush. I'd love to play more often, but not a game that I think fits my play patterns very often. I'm into the second round of the Yucata St Petersburg tourney. Its still fun, but I think at a certain point that game becomes more the luck of the draw (if all players are playing at a high level). I still make mistakes from time to time.